CommissionCrowd is bringing the commission-only sales industry out of the dark ages with the world's first and only online platform dedicated to connecting great companies and experienced self-employed sales reps and making it stupidly easy to work together. Why? Because job-boards and generic websites simply don't cut it anymore. The commission-only sales industry, for many, is still shrouded in mystery. So let's take a few minutes to bust some of the most common myths and misconceptions about commission-only sales professionals and the companies who work with them. Truth: The fact is that commission-only sales people are typically highly experienced sales professionals that have had a long and successful career in sales and make the decision to break away from the constraints of employment to either work for themselves or start a sales agency. Companies who view self-employed - commission-only - sales professionals as cheap or free labour usually end up being brushed aside in favour of companies who understand and can convey the benefits of a mutually beneficial working relationship. Companies wishing to work with freelance sales professionals should educate themselves and prepare properly before making contact with reps. You must always remember that self-employed sales professionals incur the costs associated with running their own business and developing territories for the companies they work in partnership with. Rightly so, they are extremely selective about who they choose to work with, so you need to do your homework before jumping in. You should take some time to read through some of the informative articles on CommissionCrowd's blog which will help you understand what's required in-order to be successful. Truth: This is a common misconception that stems from the negative publicity that some unscrupulous companies have received in the media. Unfortunately there hasn't been much progression in the industry prior to CommissionCrowd and there's still a long way to go to address the common stereotypes and misconceptions that have been set by poor companies. Shady companies who hire pop-up offices to appear successful and prey on desperate or inexperienced people to sell cheap items door to door or hold clipboards in the street are perfect examples of companies that have tarnished the public image of commission-only selling. Experienced self-employed sales agents tend to already have many contacts within particular markets and industries. This means a company that successfully forms mutually beneficial working relationships with independent sales reps can tap into a sales rep’s existing network and find new routes to Market very quickly. An example of this in action occurred when Intel bought Digital Equipment Corp’s semiconductor business – they used outside sales professionals to sell three lines of products in markets where its in-house, employed sales force had no experience or contacts whatsoever. The reality is that there are millions of highly experienced self-employed sales agents who work in partnership with a great number of successful companies globally. Truth: There's a lot more to working with freelance sales people than meets the eye and companies setting out to connect with freelance sales people for the first time usually get it very wrong. The example above clearly shows a company that simply don't understand what self-employed sales professionals look for or expect from quality commission only sales jobs. This company state that they are looking for full time applicants who presumably will be expected to work from their offices and have set working hours from 8:30am - 5pm Monday to Friday. Whether intentional or not, this company are essentially advertising for free/cheap labour while expecting the sales rep to conform to all of the rules and restrictions that a paid employee typically are. 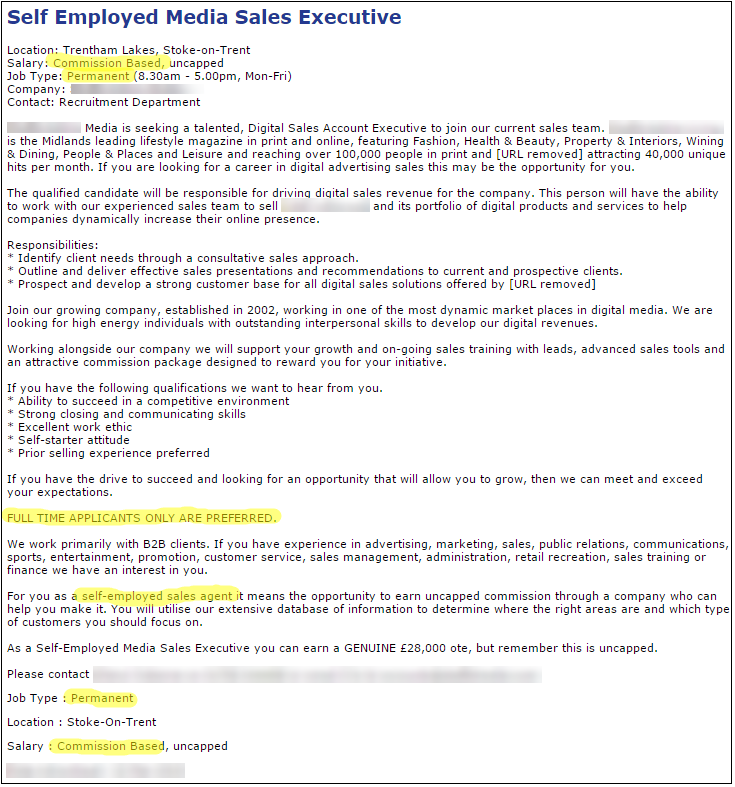 What's more, this advertising sales job is technically illegal. They need to understand that self-employed sales reps represent multiple (non-competing) companies at any one time and simply won't take - what's effectively a job - that doesn't pay a wage. It's these types of poorly structured job listings that plague the job websites and make it very difficult for sales professionals to find quality opportunities. It's also the reason that the best sales agents steer clear of generic job websites that only care about taking money from companies regardless of how bad the opportunity is. This is the reason that the team here at CommissionCrowd work very closely with each of our members to educate and help them to structure their opportunities and understand what it takes to build a successful self-employed sales force. 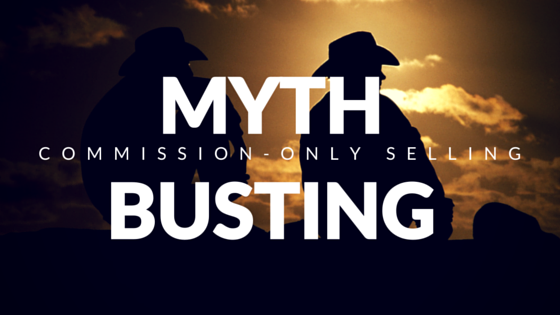 Truth: The truth is that commission-only sales agents very much exist. In fact there are millions of highly experienced independent sales people globally and they represent nearly every industry you can imagine. It's a highly fragmented industry and the problem for most companies is knowing where to look or how to create an opportunity that's attractive enough to interest them. Truth: If a sales rep brings your company a piece of new business, that person should always be compensated on a recurring residual basis. The quickest way to lose your reps and the customers they serve is by ignoring this rule. A sales agent should always, without exception, be paid on all current and future business conducted by a client they introduce you to. Whether it's a commission on up-sales, new products or services or the client is on a monthly recurring payment plan, your reps should receive their commissions on-time, every time. Truth: As we've already touched upon the fact that most independent sales agents are highly experienced in sales, the chances of a rep misrepresenting a company is rare. However, a sales professional that may be newer to self-employment may require to work with companies whose products or services have a shorter sales cycle and this can be important in order to secure sustainable income during early days of self-employment. Telling that person that the sales cycle of your products is days rather than months is misleading and not only jeopardises your relationship with that person and future agents, but your company may actually end up being misrepresented by agents who try to close business too quickly. Working with an agent who’s needs you can’t fulfill is not only unfair to them, but to your potential customers also. Don’t worry though, not everyone looks for companies who’s products/services have a very short sales cycle. More experienced reps that already work with a number of companies in addition to yours, and already have a high level of commission payments coming in, may be looking for opportunities that need nurtured for longer yet yield higher commissions in the long run. Truth: Managing a remote working relationship can be difficult and time consuming. This is true not only from a company's point of view, but for sales agents also. Using multiple tools to communicate, train new agents, send important information back and forth, requiring to know how leads are progressing and using different CRM's from eachother can quickly cause a break down in communication. In the same respect, sales agents don't want to take their time away from selling in-order to produce sales activity reports, wait for documents to be emailed over or wait for replies to important questions. In fact that's just scratching the surface of the problems that existed before CommissionCrowd was launched. It's a problem the founders of CommissionCrowd faced many years back when they ran a company that had a requirement for an external sales force. They built up a successful outsourced sales team over a number of years but quickly found that instead of growing their business, their time was now dedicated to growing and managing relationships with their sales partners. Something had to be done to ease the strain so they decided to work closely with their reps to develop a platform that would take all of the stress out of managing a two way relationship. And so CommissionCrowd was born. Now companies can continue to grow and their sales partners could eliminate all of the mundane, time consuming tasks that took their time away from selling.